During the VIP tour an agreement was signed transferring ownership of the Spot-7 observation satellite, Azersky, from the French company Airbus Defence and Space to the Azerbaijani satellite operator, Azerkosmos. President of the Republic of Azerbaijan Ilham Aliyev participated in this ceremony and received first the symbolic image from the satellite before launching the commercial activity of Azersky. The national stand of Azerbaijan, located in the lobby of Baku Expo Centre and presented by the Ministry of Communications and High Technologies, informs the exhibition’s visitors about the important projects underway to develop the industry and displays information about the rapid development of the ICT sector in Azerbaijan. Also in the lobby is the stand of the United Nations, which is promoting its important projects to visitors. The International Telecommunication Union, which will soon be celebrating its 150th anniversary, is participating for the first time at the exhibition with a stand. Also in the lobby of Baku Expo Centre is the Baku 2015 stand, which reflects the preparations underway in Azerbaijan for next year’s European Games. This year the exhibition presents telecommunications, networking, broadband, wireless and satellite communications technologies; software and automation systems; and IT and office technologies. Two hundred and fifty companies from 23 countries, including leading ICT companies, mobile operators, Internet service providers, systems integrators and distributors of well-known brands, are participating in the anniversary Bakutel. Great Britain, Israel, Italy, Canada, Turkey, Croatia and Estonia are among the countries represented at the exhibition, with their companies demonstrating ICT products and services which are not only new to Azerbaijan, but to the whole Caspian region. Many exhibitors have given presentations of their products, including a universal platform in Azerbaijani, Azerbaijan's first ERP system, an LED video wall for art installations, the latest GPS technologies for tracking and vehicle fleet management solutions, Mobile Wallet solutions and more. Other products and services on display include fibre-optic cables, integrated solutions and services for fibre-optic technology, FTTH (Fibre-to-the-home), high-quality satellite and terrestrial systems and accessories, unique gadget glasses made by Epson Moverio, and an innovative virtual-reality headset from Oculus Rift. The anniversary Bakutel offers a platform for wide-ranging business dialogue between specialists, including conferences and seminars that will enable the discussion of the latest trends in the global ICT industry as well as the prospects for the development of ICT in Azerbaijan. Thus a conference on the topic of “The Internet of Things”, organized by the Ministry of Communications and High Technologies of the Republic of Azerbaijan, has taken place in the framework of the exhibition. The conference touched on the issues of the next stage of evolution of the Internet. Secretary-General of the International Telecommunications Union Dr Hamadoun Toure, Minister for Communications and High Technologies Ali Abbasov, and Vice President of Intel John Davies were among those who gave presentations at this event. To celebrate the anniversary, a panel created by the exhibition’s regular participants and displaying the exhibition’s logo is on display. Also in the lobby is a display reflecting the history of the exhibition over the past 20 years. For the lovers of gaming there is also a games zone in the lobby, where visitors can score a goal in the virtual world or can show off his/her skills on the race track. Robots welcome visitors to the exhibition and, for the first time, performed their show program. Additional events celebrating the exhibition created a special sense of occasion and a festive atmosphere due to their richness, colour and diversity. Invaluable support in the formation and development of the exhibition is provided by the Ministry of Communications and High Technologies of the Republic of Azerbaijan. The National Confederation of Entrepreneurs’ (Employers) Organizations of Azerbaijan Republic and the Azerbaijan Export and Investment Promotion Foundation also support the exhibition. For many years influential organizations, including the International Telecommunication Union and the United Nations, have also supported the exhibition. The general sponsor of Bakutel 2014 is Intel (US?). Among the other sponsors of the exhibition are Eurodesign (Azerbaijan) and Tecnotree (Finland). 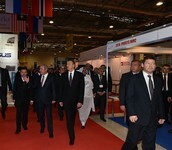 The organizers of the exhibition are Iteca Caspian, ITE Group Plc and Caspian Event Organisers.